BWU, founded in February, came up with the “Ain’t I A Woman” march as a way to include black women more in today’s women’s rights movement. The event was intended to uplift and empower black women while highlighting the multitude of issues affecting them. Imani Mitchell, one of the organizers, told HuffPost that the overwhelming whiteness of the Women’s March in January left many black women feeling as though the event wasn’t for them. 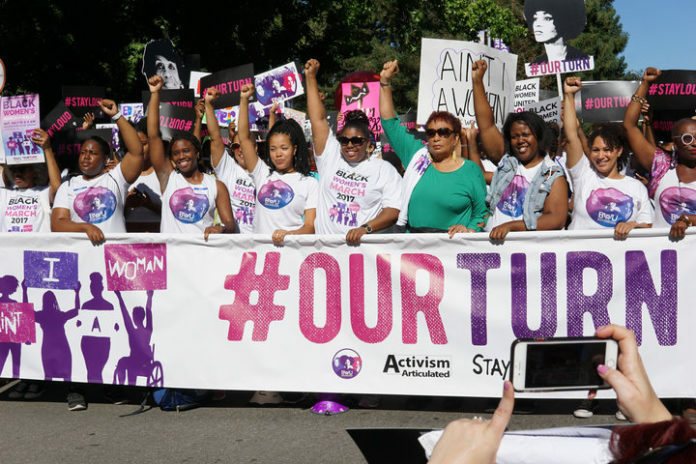 The name of the march comes from Sojourner Truth’s famous 1851 “Ain’t I A Woman” speech, in which the activist stated that black women are erased from the conversation about women’s rights time and time again. “I have borne thirteen children, and seen most all sold off to slavery, and when I cried out with my mother’s grief, none but Jesus heard me! And ain’t I a woman?” Truth said. Mitchell said Truth’s 1851 speech still resonates today. Saturday’s event included a march to the state capitol building, and speeches by former Black Panther leader Elaine Brown, black and trans rights activist Raquel Willis and other notable activists and organizers. Mitchell said she hopes BWU can help bring black women’s rights marches to other cities and emphasize the importance of their voices everywhere.